The Muskoka Chair is named after the Lake Muskoka region in Canada and this is where our chairs and footstools are produced from Northern Ontario pine, or British Columbia Western Red Cedar. This style of chair (similar to the American Adirondack chair but more comfortable!) has been seen on porches, lawns and decks on the other side of the Atlantic for over 100 years. The chair epitomizes lazy sunny days relaxing, reading a book or having a chilled glass of wine. Its angled seating position ensures that you are comfortably supported and the arms are flat and wide enough to hold a dinner plate so you have everything you need in one place. We love these chairs and sat in a lot of them to find the most comfortable. From what our customers say, we got it right! We love to find beautiful well made recycled products for the garden and even better, they are fairly traded. 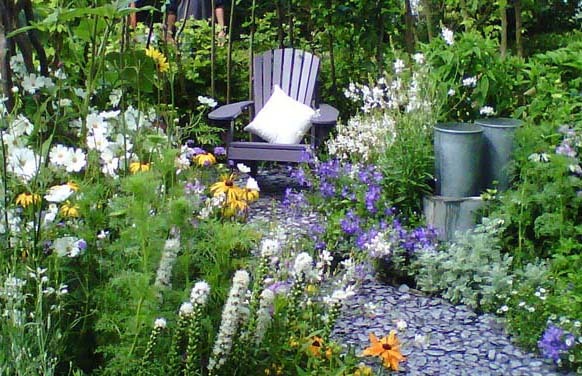 Some info on the above photo: One of our Muskoka Chairs was chosen for a show garden at Taunton Flower Show. The 'Ray of Hope Garden' for SURE (Somerset Unit for Radiotherapy Equipment) was designed as a tranquil space for someone undergoing treatment in which to recuperate. The designers' (David Stubbins and Fiona Johnson) hardwork was rewarded with a Gold award and also won Best In Show. Genuine Canadian Muskoka chairs, made anywhere else they're just a chair! © Francis Bay 2005-19. All rights reserved.